The SUN is finally here!! I can’t believe it! You look in the sky and there is this bright glowing thing!! Well, Minnesotans, beware! With our long winter be cautious to break out that virgin skin in this nice weather without remembering how easily your skin can burn. But we have some great solutions that are natural and non-toxic! Coconut oil can have a SPF of up to 5. You can apply that and you have natural sun protection. Even the jar you cook out of in your kitchen will work just fine! Need more protection? Add carrot seed oil and you can get an SPF of up to 30. Need something that might withstand some sweat or even beach or pool time? Concerned to try the above home remedy on your kids? 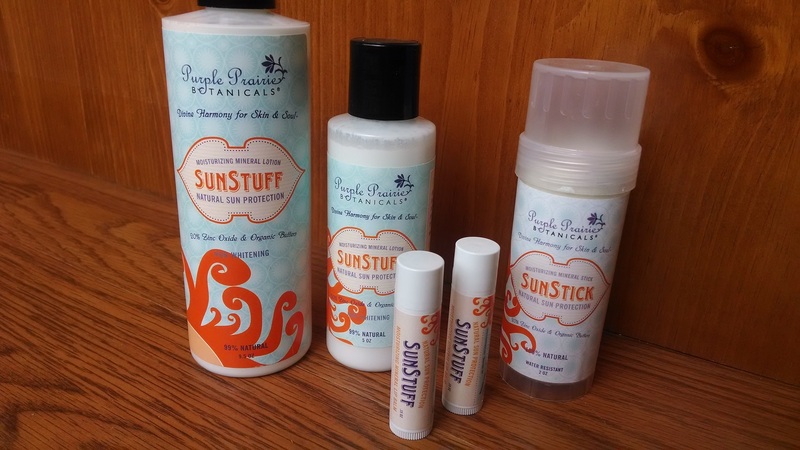 We now carry a new company to us that is Minnesota made…Purple Prairie Botanicals! We are loving their products and have their non-toxic sun protection in stock for you in time for the holiday weekend. Come check it out along with some other great products they make!